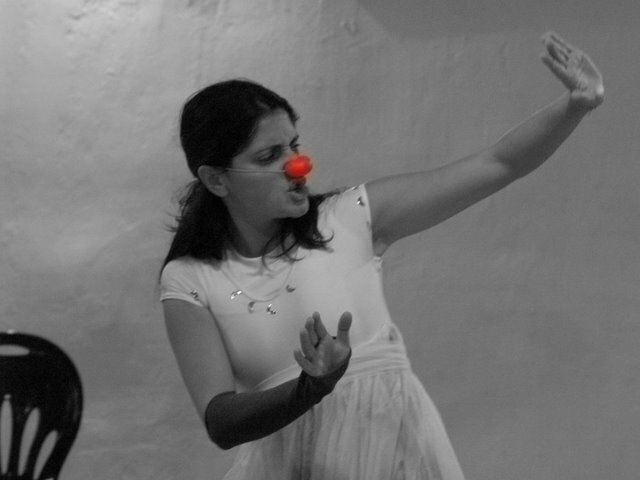 In this interview, organisational consultant, group facilitator, community builder, clown and constellator, Sharon Usher talks about her experience of bringing together two bodies of work – Improvisational Clown Theatre and Systemic Constellations. She shares some of the learning from a collaborative training with Judith Hemming in October 2010 called ‘Clowning Constellations and Community’, which they ran in a spirit of exploration. 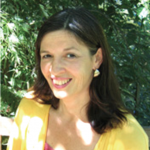 Sharon also observes the way that both disciplines work with the knowing field and how it influences her way of working. Interviewer: Can you say a little about the traditional role of the clown in a social and organisational setting for the benefit of our constellation community. The clown is a dweller on the edge. She has a unique relationship to ‘the rules’ in a social/organisational setting and hence it follows, it seems to me, to the formation of conscience and loyalty. The options for most of us are to go along with or to break the rules, however, the clown has the option to play with them. And in playing with them, they are brought to light in an accepting way that challenges at the same time and so may also undermine some of their ‘subconscious stickiness’ (my term :O). We explore extensively in our work what it means to transgress i.e. to surface and play with the obvious and the less obvious rules, habits and values of a system. As a visual cue that serves as a metaphor here, we use a rope in our work to delineate the boundary between the stage and the audience. The clown can play with that boundary, approaching it, seeing how we in the audience react, putting a toe over, looking at us again, even leaping over it (then leaping back and apologising to an extraordinary degree). However, it is only pleasurable to transgress in this way, for the clown and the audience, if we all know that the clown knows that they are transgressing a boundary, and they play and replay that fact. For some reason, everyone finds that a real pleasure! Interviewer: How did introducing systemic principles affect the clowning experience for your trainee participants at the event you ran with Judith? Well, participants varied from first-time clowns to those with years of experience. I think the introduction of systemic principles, and particularly personal constellations, upped the stakes significantly for our practice on the course. It required that those folk, who volunteered to bring some social clowning to a deeply personal constellation, trust the fundamental innocence of their clowning to an extraordinary degree. We often invite personal stories on our trainings, and often these can be vulnerable places for the person offering them. But with a constellation we are surfacing what is hidden, even to the storyteller, so the level of vulnerability is increased. The social clowning is improvised and has no agenda other that what emerges through the play, so the clowns are equally vulnerable. The clowns needed to experience that the play can indeed be trusted here too i.e. the healing field moves the clowns, as long as they can be open to it. And what needs to be expressed is expressed. As clowns, we go into the play with no agenda, in much the same way that a constellator facilitates a constellation. However, as clowns we do not have any organising principles behind us, other than our own authenticity and a commitment to going with whatever takes our attention and staying with the most playful and enjoyable. Interviewer: What else did you discover by bringing in principles and practices from constellations such as conscience, phenomenology and resourcing? The clown, at her best, is a fundamentally phenomenological being, so trusting the impulse of the moment to unfold the story is simply how she lives anyway. 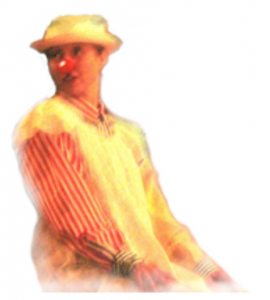 And the clown is no stranger to those moments of uncanny magic when an unplanned and unexpected coherence suddenly emerges during an improvisation. So the people who had experience of clowning could embrace the practice of constellations quite readily. I think those in the group who were new to both clowning and to constellations had a major amount to digest! However all were very involved in the exploration and, from the feedback we received, came away with a more inclusive perspective, and a great many good questions, about clowning and about constellations. I suspect that those people who have done clowning for some time would have no hesitation in accepting that their clown is a constant and reliable resource to them in all sorts of situations. And as I mentioned before, the clown has a particular relationship to conscience, in that she plays with the feelings that arise when she breaks rules/habits/values. When this happens there is often an enjoyment, or sometimes a poignancy, in the audience that comes with the recognition of our common human vulnerabilities and perennial ‘failings’ as we gamely attempt to navigate this life..
Interviewer: Part of the training programme involved bringing a clown actually into a client’s constellation. What was the impact of doing that? I was the clown who experimented with being there with the issue holder from the beginning of her constellation. I found that my impulse was to sit on the floor just behind her as she had her interview with Judith. I felt immediately engaged and connected to her and wanting to keep a very low profile. But of course, it was a strong image for everyone in the circle. Who knows what impact that had. As the constellation progressed I found that my attention was constantly with her, my listening felt acute, my heart wide open. I stayed put at the edge of the circle as she found her place in the constellation. At one point there was a reference to some missing voices in the constellation and I found myself moving straight in and speaking them. Interviewer: Having been on a journey of discovery, integrating constellations into your clowning work life, how does it influence what you do now? There are a number of ways that constellations inform and support my work now. 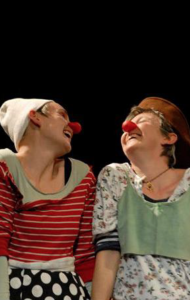 The clowning relies on the development of a safe group context for people to explore as deeply as they wish to. So as a facilitator I pay as much attention to the balancing of the orders as I can in the set up and holding of the group. I feel personally resourced as a facilitator in my guiding of improvisations on stage by my knowledge of the orders. The more I can encourage people to express it on stage when some balance is being lost the more fun they have as the flow finds its way e.g. when someone is initiating the action all the time (giving) I can bring balance by gently guiding them to stop, and to receive from their partner. I feel that my study of constellations has underlined my trust in the friendliness of the field and that, in turn, gives me courage in all my improvisation work both as a clown and as a clowning facilitator. Interviewer: Thank you so much. There is a strong sense of how clowning and constellations enable us to be with ‘what is’. Could you share a last image or thought that captures this potential for their restorative capacity? Definitely. It comes from Henry Miller and is called ‘The smile at the foot of the ladder’.